SEJONG — South Korea is in negotiations for four different free trade agreements involving 19 countries. The four are talks on a joint agreement with China and Japan (2 countries); with China, Japan, India, Australia, New Zealand and the 10-member Association of Southeast Asian Nations (15); with Ecuador (1); and with Israel (1). As a developed process, Korea has signed a preliminary pact with five Central American countries — Honduras, El Salvador, Nicaragua, Costa Rica and Panama — which made it the first Asian country to reach the bilateral deal with a Central American trade bloc. Guatemala might join the FTA later. Analysts share the view that successful results for the four ongoing talks and fast-track effectuation of the Korea-Central America FTA are dependent upon the commerce-related strategies of the Ministry of Trade, Industry and Energy. Despite its deals with 15 trade blocs including 52 partner countries, starting with the Korea-Chile FTA in April 2004, Korea had failed to reach a consensus in some past negotiations with partners like Mexico and the six-member Gulf Cooperation Council — Saudi Arabia, Kuwait, United Arab Emirates, Qatar, Oman and Bahrain. The export-oriented business sector is pinning hopes on the coming performance of Minister for Trade Yoo Myung-hee, who took office in February 2019. 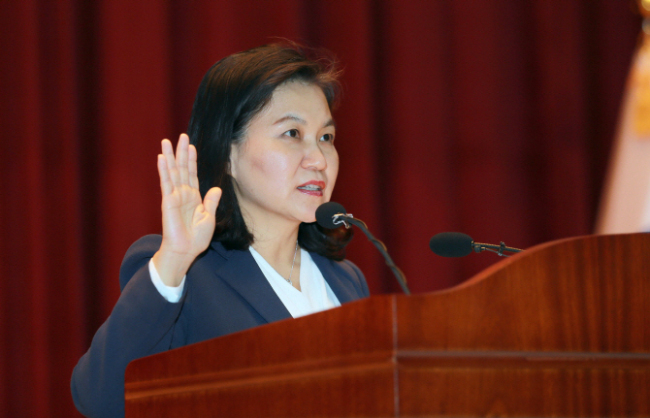 Yoo, 52, is drawing attention for her career as a civil servant for the commerce-focused foreign affairs sector since she passed the Higher Civil Service Examination in 1991. For her recent activity, Yoo as then-Deputy Minister for Trade led the country’s delegation during the 14th round of negotiations for a Korea-China-Japan free trade agreement, held in Beijing in December 2018. The Pacific Alliance is a trade bloc, composed of Mexico, Chile, Colombia and Peru, launched in June 2012. Its collective population and gross domestic product come to 210 million and $2 trillion, as the world’s ninth-largest continental bloc. The PA designated four countries such as Singapore and New Zealand as quasi-members in 2017. The ongoing talks with 15 countries is dubbed the Regional Comprehensive Economic Partnership, which seeks gradual opening of the markets among 16 Asia-Pacific countries — South Korea, Japan, China, India, Australia, New Zealand and the 10-member ASEAN. But the 16 countries have faced a deadlock in progress for the RCEP. Minister Yoo said, for a breakthrough, the government is moving to initially sign bilateral pacts with three Southeast Asian countries — Indonesia, Malaysia and the Philippines. The market is focusing on the new minister’s “flexible” strategies, according to an analyst in Yeouido, Seoul. “A point would be a success in diversification of trade partners in the coming years, as the government has continued to pledge,” he said. The Korea Chamber of Commerce and Industry welcomed the Trade Ministry’s policy toward diversification. In light of such concerns, the government is keeping a close watch on tariff disputes between economic powerhouses, as the Korean economy is highly dependent on trade with China — its largest trade partner — and the US. Furthermore, trade volume with three countries — China, the US and Japan — takes up more than half of the total. In addition, businesses in the private sector are pinning hopes on the government’s upcoming trade talks, which could pull up the ratio of trade volume with countries like Saudi Arabia (Korea’s ninth-largest trade partner), Russia (12th), UAE (16th) and Iran (20th).